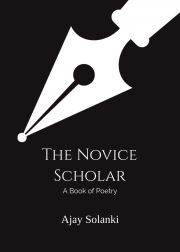 Description of "The Novice Scholar"
This book contains poems which are based on actual experiences of the Author's life. For some people, this book can be a medium of entertainment, and for some, it can open doors to their self-consciousness. Read these poems whenever you need to talk to yourself, and I promise, this one will not disappoint you. Author Ajay Solanki is a graphic designer professionally and seeks asylum in books when he is not doing graphics. Doing poetry is an art which runs in Ajay's veins. His grandfather was a writer himself, and his uncle also used to write for magazines. Ajay is hoping to carry that legacy further. Reviews of "The Novice Scholar"